Some days, New York really grinds you down and destroys your will to live. Congratulations! You have been selected to receive tickets for a special taping of "Spectacle: Elvis Costello with... Smokey Robinson." Not even blog-related... as far as I know, this was just because I'm on Elvis Costello's email list and happened to get lucky. "Spectacle" is a talk show with music (it starts airing on Sundance Channel in a few months). So this was over two hours of geeked-out shop-talk between two genius songwriters, bookended by live performances. 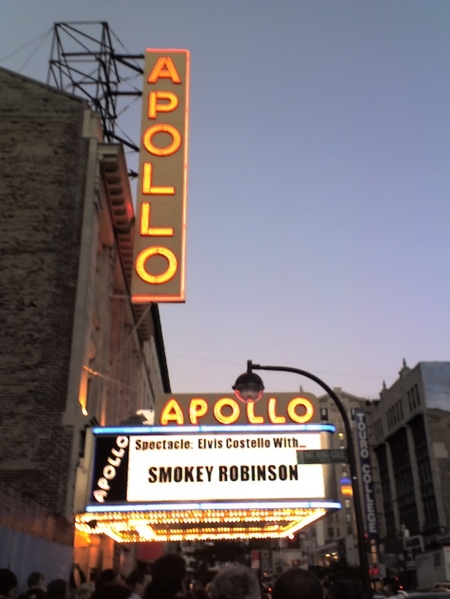 Smokey had an inexhaustible supply of great stories, the best of which was about showing up at the Apollo with the Miracles for a show in the group's earliest days. They were too green to know that when you played the Apollo, you had to bring arrangements for the house big band -- which happened to be, that week, Ray Charles's band. But all the Miracles had was onionskin lead sheets for "Bad Girl." The house manager threw a massive fit and wanted "those ignorant Detroit boys" flayed alive, but Ray calmly intervened, asking the (terrified and starstruck) Smokey to play through a chorus of his song at the piano. Then he took over at the piano, started playing the tune like he'd written it, and began dictating an arrangement on the spot -- "Here, saxophones, you play this" (and Smokey proceeds to sing Ray's lines like this all happened yesterday), "trumpets, you play this; trombones, you play this; guitar, you play this. Write that down, okay?" Costello and the Imposters opened with "Going To A Go-Go," and a few lesser-known Smokey tunes (including "The Hunter Gets Captured by The Game"). After some conversating, Smokey sang Norah Jones's superhit "Don't Know Why" (penned by Jesse Harris) and a cruelly abridged version of "The Tracks of My Tears" with just Steve Nieve on piano. More confab ensued -- including an embarrassed admission by Costello that the dancing in this video was the Attractions' best effort at some Miracles-style choreography -- and then he and Smokey closed with a close-harmony duet on (of course) "You've Really Got A Hold On Me," which is clearly the definitive obsessive/destructive love song. After L. and I signed our first lease in the city (just about five years ago now), we wandered down the street to find a bar where we could get ourselves a celebratory drink. As we were anxiously toasting to our new life in NYC, someone put "I Second That Emotion" on the jukebox. I took that as a good omen. Thanks for taking the time to blog about Spectacle! That had to have been an amazing evening. I went to the taping before Smokey with Elvis and The Police, and I have to say it was as if I died and had gone to musical heaven. I can't wait to see the finished versions of both of our shows and hear more great stories from Mr. Robinson. If you are interested, I recap the Elvis/Police show here. Sounds like an amazing show for reals. This is only slightly related...but one time in Baltimore my brother ran into Elvis Costello. He was walking down the street and Mr. Costello got out of a car just in time to run directly into my brother! Good Times.